This is the first interview in what has turned out to be our very own saxophone trio, a series of three interviews with some of the UKs finest exponents of their respective instruments. With chivalry dictating that it should be ladies first, we kick things off with altoist, Laura Macdonald. Laura has been a mainstay of the Scottish jazz scene for a number of years. 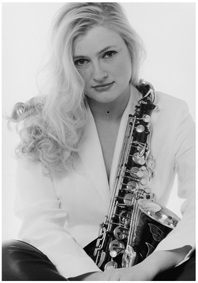 As alto saxophonist with the Scottish National Jazz Orchestra, she also released a couple of highly regarded albums on Spartacus Records. Her self-titled debut showcased her formidable playing in the company of drummer Jeff ‘Tain’ Watts, bassist James Genus and David Budway on piano recorded in New York; and was followed up with the superb Awakening that revealed Macdonald to be a composer to watch out for. If the intervening years appear to have seen the saxophonist disappear of the national and international radar, she has been continuing to work at her music in her native Scotland, juggling her career with bringing up her young family. With the release ofDuets again with a New York based pianist, this time David Berkman, Laura has once again demonstrated that if to many she appears to be keeping a low profile there is a sharp musical mind at work and that trait is immediately apparent in the new recording. Following on from this Laura spent some time in the States studying at Berklee College in Boston. “My experience at Berklee was one of the most positive times of my life,” she says “ A whole mix of cultures and musical styles, and a massive organisation there to back up your development. I had a lot of positive experiences at Berklee. My teacher was George Garzone and he was just amazing. Also, Hal Crook.... he was so life changing to work with. Amazing memories and tools to call upon for the rest of my musical life.” And when touching on the subject of influences, Laura immediately rattles off “Cannonball, Coltrane, Keith Jarrett, Maria Schneider, Mahler, Elgar, Charlie Parker, Claus Ogerman, Michael Brecker... too many....” she laughs. To read our review of Duets by Laura Macdonald & David Berkman click on the album cover. For more information visit Laura’s website.